Small specks or clouds moving in your field of vision as you look at a blank wall or a clear blue sky are known as floaters. Most people have some floaters normally but do not notice them until they become numerous or more prominent. In most cases, floaters are part of the natural aging process. Floaters look like cobwebs, squiggly lines or floating bugs, and appear to be in front of the eye, but are actually floating inside. As we get older, the vitreous-the clear gel-like substance that fills the inside of the eye-tends to shrink slightly and detach from the retina, forming clumps within the eye. What you see are the shadows these clumps cast on the retina, the light-sensitive nerve layer lining the back of the eye. The appearance of flashing lights comes from the traction of the vitreous gel on the retina at the time of vitreous separation. Flashes look like twinkles or lightning streaks. You may have experienced the same sensation if you have ever been hit in the eye and seen stars. Floaters can get in the way of clear vision, often when reading. Try looking up and then down to move the floaters out of the way. While some floaters may remain, many of them will fade over time. Floaters and flashes are sometimes associated with retinal tears. When the vitreous shrinks it can pull on the retina and cause a tear. A torn retina is a serious problem. It can lead to a retinal detachment and blindness. 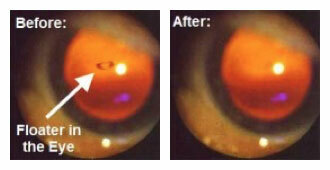 If new floaters appear suddenly or you see sudden flashes of light, see an ophthalmologist immediately. Also known as laser floater removal or vitreolysis, LFR is a non-invasive procedure that can eliminate the visual disturbances caused by eye floaters. The goal of LFR is to achieve a “functional improvement”. That is, to allow you to return to “normal” day-to-day activities without the hindrance of floaters. LFR involves the application of nanosecond pulses of laser light to evaporate the vitreous opacities and to sever the vitreous strands. During this process, the floater’s collagen and hyaluronin molecules are converted into a gas. The end result is that the floater is removed and/or reduced in size. LFR is performed as an outpatient procedure at the ASC (Ambulatory Surgical Center). Prior to the procedure, your eye surgeon will administer anesthetic eye drops to provide mild anesthesia. A contact lens will be placed on your eye, with the laser light delivered through a specially designed microscope. During treatment, you will likely observe small, dark specks/shadows- signaling that the floaters are being evaporated into small gas bubbles. These gas bubbles quickly dissolve and reabsorb into the vitreous. After the treatment, your eye surgeon may treat your eyes with anti-inflammatory drops. You may observe small, dark specks in your lower field of vision immediately following treatment, but these small gas bubbles will quickly dissolve. It is also important to note that some patients may experience mild discomfort, redness or temporarily blurred vision directly following treatment. A treatment session typically takes 20-60 minutes to perform and some patients will need to undergo two treatment sessions in order to achieve a satisfactory result. Reported side effects and complications associated with LFR are rare. Side effects may include cataract and intraocular pressure (IOP) spike. Retinal detachment has been reported rarely. What if LFR doesn’t work for me? Clinical studies have shown that LFR is a safe, effective treatment in the majority of patients. If floaters persist, however, your ophthalmologist may recommend surgery.